this is the be-all-end-all of best humidors ever made! Dove tailed and jointed corners to keep the water from stretching out the perfect fit of the lid. A magnet sandwiched between the Spanish cedar interior and the outside veneer wood so that all the hydrometer and humidifying components will not fall onto your cigars after adding water. Throw in a couple Boveda humipacks and this will simply be the last humidor you will ever buy! The quality of these humidors is comparable to Davidoff and Elie Blue without the high price tag (exceeding $1500.00 to $4000.00). These humidors sell for $275 for 30 count, $375 for 90 count, and $575 for 120 count, respectively. They come in 5 finishes and all have a bottom tray that keeps your cigars lifted up off the bottom of the humidor so the humidity can circulate over and under your cigars, you won't have to rotate them. The largest size comes with a tray to keep your favorite cigars from spying eyes, if you want to give away (your not so good ones) to your (not so good friends). I have sold these for a few years now and the BEST part is people keep talking about how fresh their cigars are...these humidors are just doing the job they are supposed to do. Isn't that what we want? We recommend Boveda for humidification in all your humidor products. I have owned a cigar shop for over 26 years and this is the best product to keep your cigars fresh period. See the video below to explain how Boveda works. Our retail on Boveda is 4.95 per sleave no matter what percentage you need. Boveda's built-in reverse osmosis membrane provides the same type of hyperfiltration that's used in water purification systems by inhibiting the passage of ions (such as salt) or other impurities, ensuring that only pure, clean water-vapor passes through the membrane, while rejecting everything else. No refillable-type humidification product can come close to the purity emitted by Boveda. After 15 years of selling Boveda in tobacco, we’ve got some really good answers to common customer questions about Boveda vs the “competition”. We wanted to cover them because the answers are as easy as using Boveda. How does Boveda work? Different salts mixed with water will naturally regulate different humidity levels. Does Boveda have propylene glycol in it? No. PG solution has zero moisture regulation abilities and can give off unwanted flavors. Is Boveda like one of those silica packets? No. Silica is a desiccant, which tries to remove all moisture and has no moisture regulating abilities. Oh, Boveda is one of those water pillows? Nope. Water pillows are humidifiers. They’re diaper material in a plastic bag. They have zero ability to regulate humidity, your cigars simply absorb all of the excess moisture they give off. What’s the difference between Boveda and refillable sponge/gel/crystal/beads/water pillows? Those products are 1-way humidifiers, they can only give off moisture. Boveda is 2-way, meaning it gives off and absorbs moisture to regulate a specific RH. Only Boveda makes a hygrometer calibration kit. If refillable items regulated humidity, those manufacturers would suggest calibrating hygrometers with their products. But they don’t. In fact, Xikar suggests a salt test, NOT their own product, to calibrate their hygrometers. And what product is a salt test? Boveda. Only Boveda is trusted in the boxes of cigar manufacturers to protect cigars through distribution. You will never find gel, crystals, beads, clay, water pillows or sponges in a manufacturer’s cigar boxes. Can I use Boveda with refillable stuff? Not reliably. The high humidity given off by humidifiers may be too much for the Boveda to keep up with. It’s like trying to regulate the heat in your house by opening a window (Boveda) after setting fire to your couch (humidifiers). Besides, why waste any time refilling humidifiers that don’t regulate humidity? Just use 1 60g Boveda per 25 cigar capacity (even if the seasoned humidor isn’t full), for 2-4 months of aging perfection, depending on humidor quality. But Boveda is "expensive". Not compared to ruining humidors and cigars with unpredictable humidifiers. And factor in all the time fussing with humidifiers in the impossible hope of regulating humidity. That makes 2-4 months of maintenance-free perfection with Boveda a total bargain. For a deeper dive into using Boveda, feel free to revisit our FAQ’s. Please let us know when we can be of service. 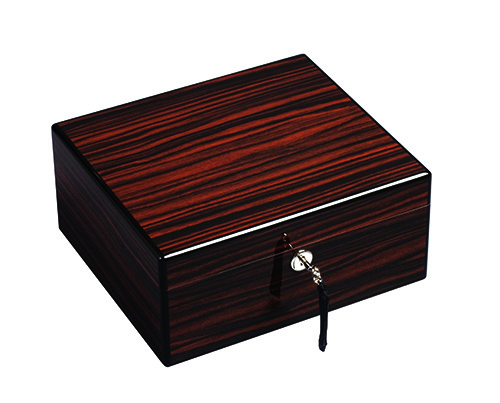 you’re considering purchasing a first humidor– perhaps you simply have been purchasing single cigars as you smoke them – you might consider starting with a less expensive and smaller humidor to see if maintaining a humidor is right for you. There are many brands of good starter humidors for this purpose. They are lined with Spanish Cedar, as any good humidor will be. But they don’t have the storage capacity or all the bells and whistles of some of the more advanced options. We carry a range of humidors that are a great value for getting started. We have private lockers available to you if you want us to watch over your cigars. If you are already a humidor aficionado and tend to store more cigars and cigars of higher value, it can be of great benefit to go with a more expensive humidor. They have more storage capacity, finer construction for a lifetime of service, and come with more durable and accurate accessories. Another nice option in a fine humidor is vented shelving to separate brands and rotate them properly. Price and aesthetics are really your factors to consider in determining the right high-end humidor. When you’re at this level, choose your humidor like you choose a high-end automobile. They are work beautifully. You just need to choose the one that fits you best. And maybe the one you can see handing down to your son someday. Davidoff and Craftmans bench are brands you should consider. If you travel with cigars, please invest in a travel humidor and a valet. So often, we hear of customers stuffing unprotected cigars in their glove boxes or in their luggage only to find the cigars damaged or dried out by the time they are ready to enjoy them. Travel humidors are smaller, containing enough storage space for a week’s worth of cigars or so. They’ll keep cigars protected and well humidified for the duration of your trip. The vallet is a hard leather case with a built in humidification system. They usually fit two or three large cigars that you’ll smoke that day. Valets protect your cigars from abuse in a golf bag or a beach sack. The finest cigar can be ruined if it isn’t properly humidified. And an inexpensive cigar can age into a fine smoke when kept properly humidified. No matter what you invest in your cigars, they deserve a reasonable investment in humidification. Keeping cigars properly humidified is the single most important factor in determining a cigar’s inherent smokeability. A cigar that is too dry smokes too hot and ashy and can unravel. A cigar that is too moist can make a comfortable draw almost impossible. Whether you are holding your cigars in a humidor (recommended), a cabinet, a cellar or a window sill, the trick is to balance the right air temperature with the right relative humidity. The chart below shows the proper relative humidity for different temperatures.